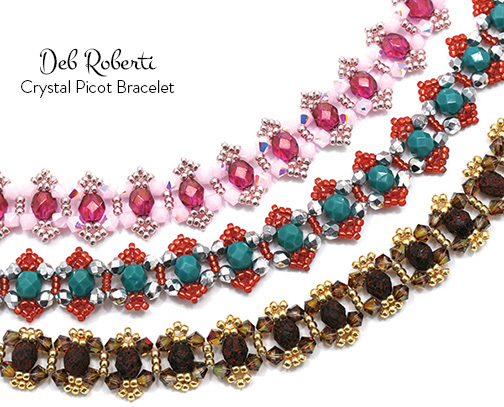 Use size 11 seed beads and any type size 4mm and 6mm beads to create this pretty crystal bracelet that works up fast. For the exact beads used in the photo above, click HERE to go to the RedPandaBeads.com Gallery of Color Suggestions. 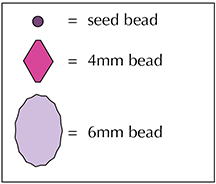 String a seed bead, a 6mm bead, a seed bead, a 4mm bead, three seed beads and a 4mm bead. Step 3: String a seed bead, a 4mm bead, three seed beads, a 4mm bead and a seed bead. Step 9: String a 4mm bead, a seed bead, a 6mm bead, a seed bead and a 4mm bead. Step 11: String a seed bead, a 4mm bead, three seed beads, a 4mm bead and a seed bead. Step 17: String a 4mm bead, a seed bead, a 6mm bead, a seed bead and a 4mm bead. Step 19: String a seed bead, a 4mm bead, three seed beads, a 4mm bead and a seed bead. Step 25: To attach one end of the clasp, string four seed beads. Go back around through these seed beads and the clasp several times to reinforce your attachment to the clasp. Step 27: To attach your clasp to the other end of the bracelet, thread your needle with the tail thread from Step 1. Repeat Steps 25-26 to attach your clasp.